Location: On Via Tor di Nona, the south bank of the Tiber River, just a little east of Ponte Sant'Angelo. Metro: None, perhaps Lepano or Ottaviano, or a walk north and west from Piazza Navona. In the 17th century, Christina of Sweden built a wooden theater, the Tor di Nona, which opened to the public in 1670. Subsequently, the building was rebuilt and inaugurated in 1795 as the Apollo Theatre, which was purchased by the Torlonia family in 1820, and given to the city of Rome as an opera house in 1869. When the Tiber River embankments were built in 1888, the theater was destroyed. 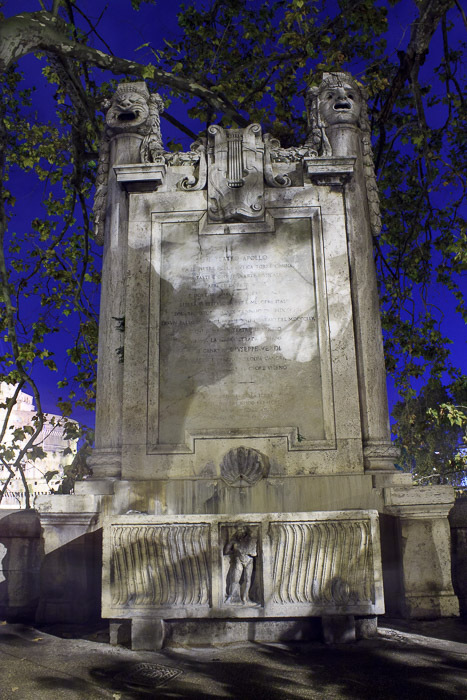 In 1925 this fountain was built on the site of the theater as a memorial. The inscription recalls the history of the theater, above which are masks from the ancient theater, laurel wreaths, and a lyre. Below the inscription is a stone sarcophagus with a central figure (perhaps Apollo), which collects water from a shell valve above. See all Fountain of the Apollo Theater photos.